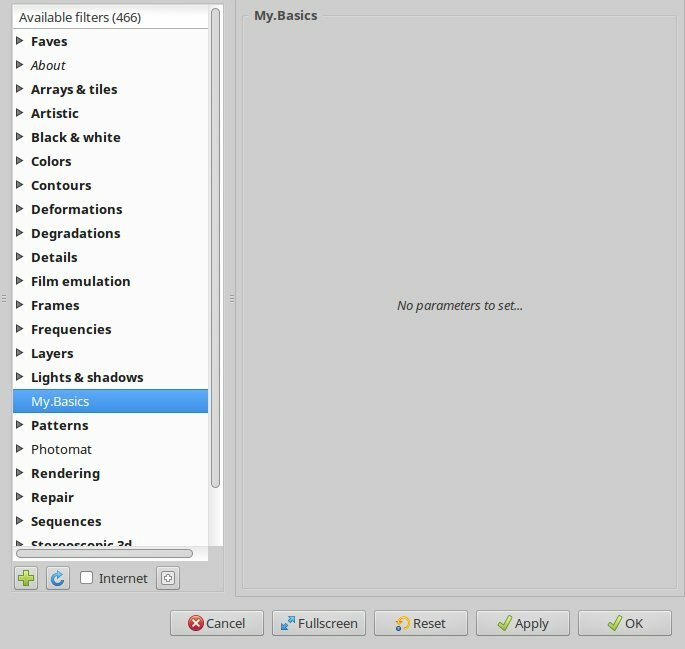 In this article I’ll describe how to adapt and rename an existing filter in the G’MIC plugin for Gimp, and create an own entry for it in the filter list. This article is based on a document written by David Tschumperlé – the main developer of G’MIC – but adapted to photographic use. Here we’ll look at the basics to make your own filter; in some follow-up articles we’ll go a step or two further. In an earlier article I explained how you could make a preset of an existing G’MIC filter and give it a new name, all on the command line. 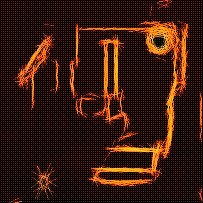 We can do exactly the same thing in the G’MIC plugin for Gimp. If you are familiar with the G’MIC plugin, you may say “But hey, if I add a current G’MIC filter with the current settings to the Faves section, I’ve got the same result, isn’t it? And I can rename it as well.” That’s right indeed, but what you can’t do that way is combining two or more G’MIC filters or leave some sliders out that you are not interested in. And that is what I am going to show in part II of this series: how to group a couple of filters that you are interested in, together in one ‘new’ filter with the default settings that you like. That means that instead clicking around in different G’MIC sections like Details or Repair to find the right filters for sharpening and denoising for example, we bring them together under a new name. But before we can do that, we must know how this G’MIC thing works, interface wise. As you will see shortly, this is not that complicated once you get the hang of it. For this example I’ll use an existing filter called Basic adjustments. 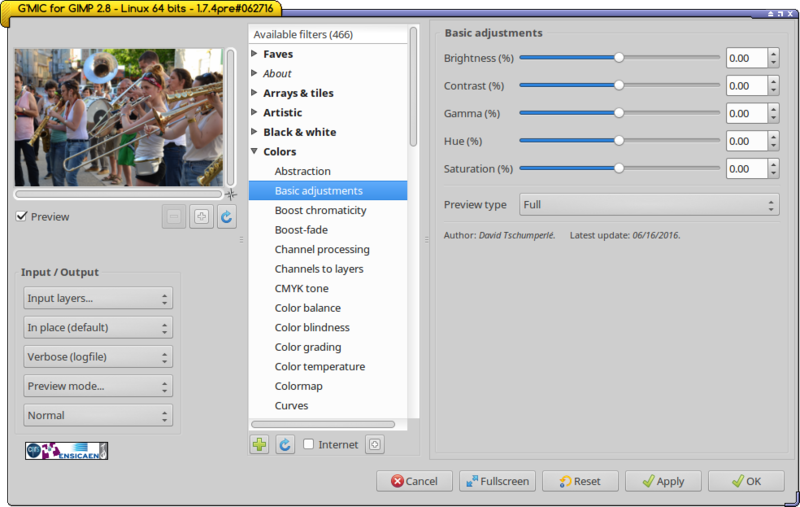 It is located in the Colors section of the G’MIC filters. (don’t type the dollar sign, just gimp and hit <Enter>). As explained in the earlier article, the filter name we are looking for is ‘gimp_adjust_colors‘ (without the _preview part) and the six zero’s at the right side correspond to the five slider values plus the preview type. Change any slider in the filter window and you’ll see corresponding changes in the terminal output. To add a filter to G’MIC’s filter list, we must make and edit a hidden file called .gmic. On Linux and OS X this file must be located in the home directory. On Windows this file is called user.gmic and must be put in the AppData folder. Nota bene. If that file exists already on your system (for example because you read and tried the earlier articles about gmic processing on the commandline), just place the following line anywhere in that file. This means: add a new filter called My.Basics to the filter list and if you click on that, execute the function my_basic_adjusts (that does not exist yet). Save the file, go to (or re-open) the G’MIC plugin window and click the Reload button located below the filter list. And hey, there she is! This is basically the command line version: when executed (that is: when the users clicks on Apply or OK at the bottom of the G’MIC window), the brightness is set to +20. That’s all to create a slider! 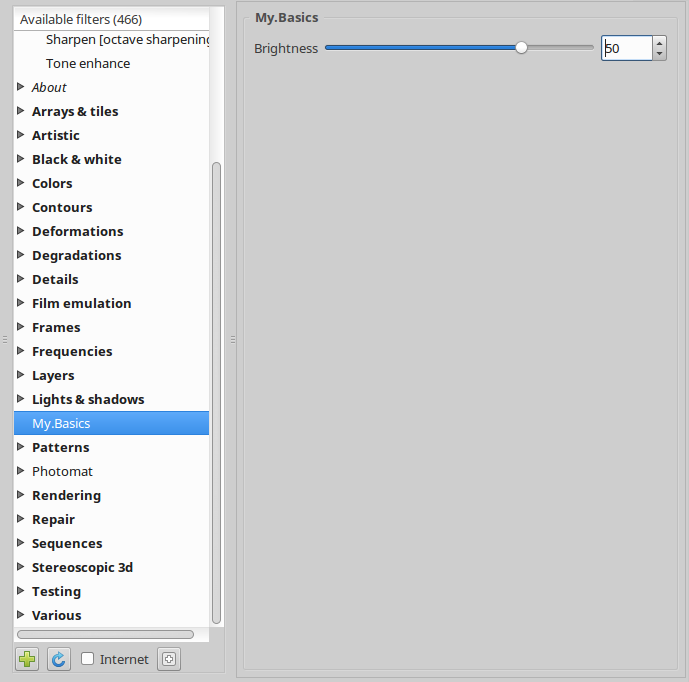 The word Brightness is the label of the slider (you can give it any name you want). On the right side it says int (0,-100,100). Int stands for integer, that means the filter accepts (or proposes) positive and negative whole numbers like -50, 0 or 2500. The default brightness value that is proposed to the user is that first 0; the range is from -100 to +100. If int is replaced by float, the user can select the fractional component as well, like -50.52, 0.10 or 2500.71. If the user clicks the Reset button at the bottom of the filter, the sliders jump back to these defaults settings (so not necessarily 0). Save the .gmic file and reload the filter list in the G’MIC window. That gives this. Banner at the top of the page: G’MIC filter Local orientation, in section Contours.